Your opponent declares a monster Level. Excavate cards from the top of your Deck until you excavate a monster that can be Normal Summoned/Set. If that monster is the same Level as the one declared by your opponent, send all excavated cards to the Graveyard. If not, Special Summon the excavated monster, also send the remaining cards to the Graveyard. This is a costless version of Monster Gate. However, Monster Gate has a better chance of summoning the monster. 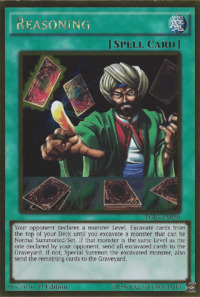 This is one of the few cards in the TCG with reference to smoking that has gone uncensored. If you have no monsters that can be Normal Summoned/Set in your Deck, "Reasoning" cannot be activated. When resolving this card, your opponent declares a monster Level and you start excavating cards from the top of your Deck. If the excavated card is a monster that can be Normal Summoned/Set, but it cannot be Special Summoned like "Tsukuyomi", it is not Special Summoned, and it is sent to the Graveyard with the other excavated cards. Dark Magician of Chaos:" When "Dark Magician of Chaos" is Special Summoned with "Reasoning", its effect activates.The latest print of "Dark Magician of Chaos" uses Problem-Solving Card Text, which makes it clear that its effect activates during the End Phase of the turn it was Normal or Special Summoned, not when it is Summoned. This difference is due to a major change in the functionality of "Dark Magician of Chaos". Pick up cards until you pick up a monster that can be Normal Summoned.The latest print of "Reasoning" uses Problem-Solving Card Text, which states that the player also stops excavating cards if they excavate a monster that can be Normal Set.